Unconscious Incompetence is when we are not even aware that we can’t do something. This is a state of blissful ignorance. Conscious Incompetence is when we know that we can’t do something. This is a state where we may not care or it may be a state of envying others the ability or a state of motivation to learn a skill. Conscious Competence is when we can now perform the task but we have to really think about it. This is a state of concentration. If we fail to match up to our own standards during this phase we may give up and fall back to the state of Conscious Incompetence and bitterness and envy. Unconscious Competence is when we no longer have to think about the skill. This is a state when we can pay attention to other things and new learning while still performing the skill. Think of how you learnt to ride a bike. First of all you did not know that you could not do it. Then you fell off and knew that you couldn’t do it. Then you really had to concentrate, but you could just about stay upright with stabilisers. Then you could do it without thinking about it. This is the learning ladder. 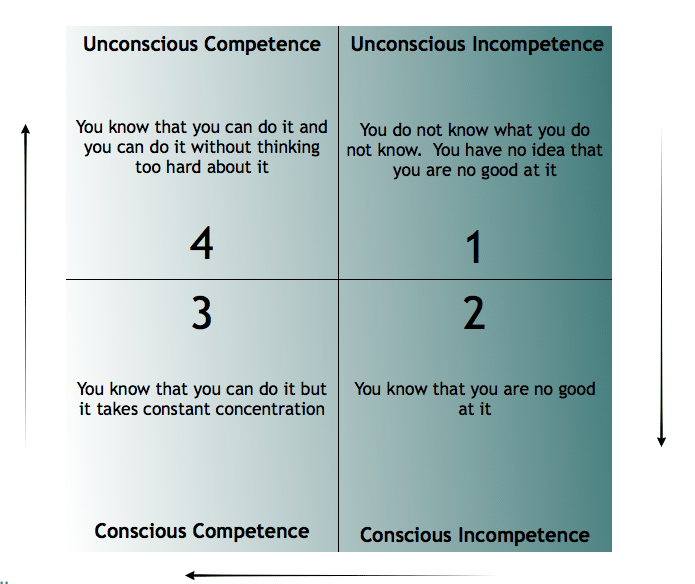 The two most likely problems are at the stage conscious competence when we need support and at unconscious competence when we may assume that we are doing well but the world has changed and we have unknowingly plummeted to unconscious incompetence.